kanata-kun is a really good actor (especially when he acted in NANA 2). He got the appeal to the audience- good looks plu good acting is equals to a genius like him. He acts naturally, and just a look at him, he looks like a kind person. Waa! >w< *carried away mode* and he is also the ryoma echizen in PoT live action and he played very well. Nya! 5 thumbs up for Knata Hongo-kun! ^_^ Gambatte! A very cute actor! I loved him in Himitsu no Hanazono. He was able to show the different sides to his character very well, and made a sad scene which would've been cheesy, very dramatic because his tears were so real. I hope he gets more roles in the future! he's is so cuteee ! but i'm 5 years younger then him. he's cute in Prince of Tennis, he suits the role of Echizen Ryoma very well. Two thumbs up for Kanata-chan! I seen Hongo Kanata in Hinokio and also i seen him in prince of tennis. 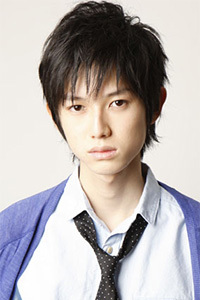 I really like Hongo Kanata and his acting he's a very smart boy to be in such movies. this boy is just too cute and he also can act...so far i luv him the most as hinata in himitsu and ryoma in pot...i still havent seen nana2..
first i saw him in the movie moon child..
i love him so much even i don't really like his acting.. not bad but he always played the sililiar characters. i love him cuz he's cute and very good in acting... i really love him in prince of tennis live action.. I love him!!!!! So Coool, looks so handsome all the time. and kawaii desu. He's so adorable! I wish I could see him personally some day... Kawaii!!! yeah...he's so cool. he really act like Ryoma Echizen! because he is one of my favorite artist in japan..